La Roque Gageac, one of the 'most beautiful villages of France', is eight kilometres south of Sarlat and on the banks of the Dordogne River. La Roque-Gageac is in a magnificent location. 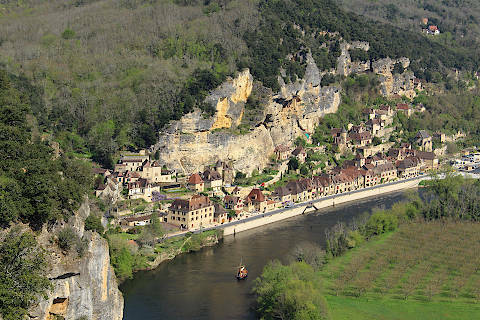 Although only a small village, little more than a row of riverside houses squeezed between the Dordogne river to the front and sheltered below the overhanging cliffs behind, it is very picturesque. When you arrive the village might seem familiar - it is one of these villages that appear very often on calendars and guidebook covers. Almost all the houses in the village are built in the traditional yellow stone of the Dordogne area and with stone roofs. The most imposing building here is the Chateau de la Malartrie, at the western end of La Roque-Gageac. Surprisingly it is also one of the most recent, having been built in the 19th century. 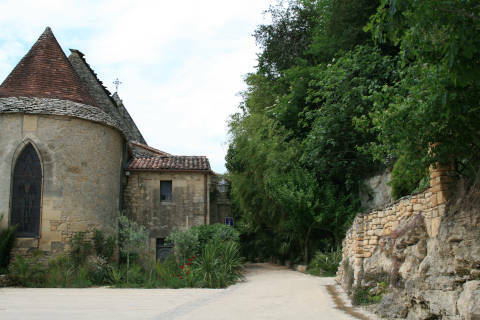 Although most houses in La Roque-Gageac are along the river, in other places the medieval houses have found the space to spread up the hill a little, towards the troglodyte caves set in the cliffs above. 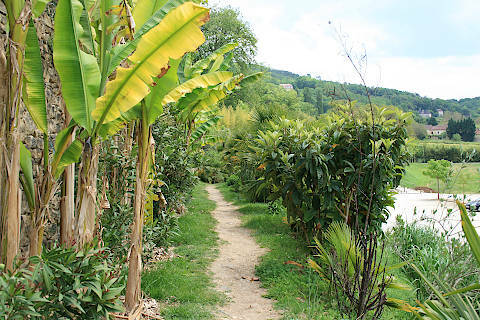 As you follow this path, first you pass an impressive renaissance style manor house, the 15th century Manoir de Tarde with a large tower overlooking the village, you then reach the caves. These are in a naturally defended position and were developed as a fort from the twelfth century onwards. 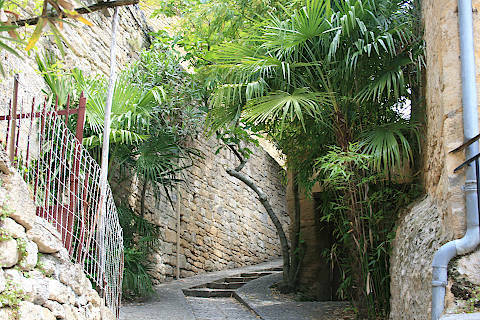 The narrow streets of La Roque-Gageac also pass through an interesting tropical garden as they climb up the hill below the cliffs. 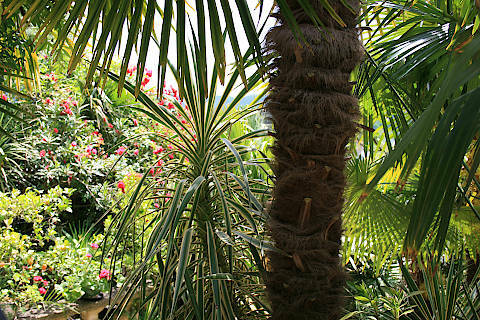 The palm trees and banana plants are able to grow here because the village is south facing and protected from north winds by the cliffs. 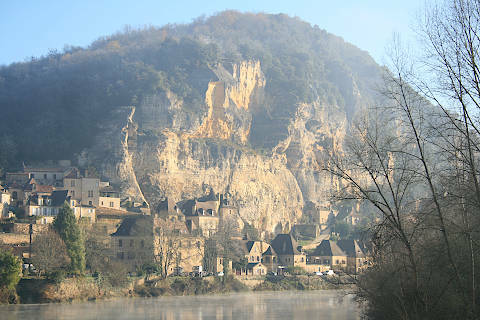 Not surprisingly, this great beauty, and being listed as one of the 'most beautiful village of France', and winning the 'prettiest village in France contest' competition, and being in the heart of the Dordogne, means there is a price to pay for La Roque Gageac village in terms of visitor numbers. But as with many of the villages listed on France This Way, that should not discourage you from visiting. It should encourage you perhaps to arrive early at La Roque-Gageac, to avoid the coaches that arrive later in the day, but come you should. It really is as beautiful as you would hope for. 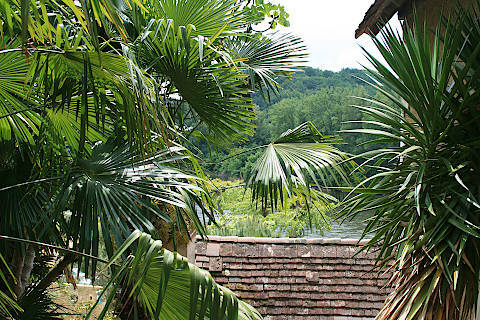 One of the most pleasant ways to enjoy the region is to take a canoe trip along the Dordogne River, which usually pass next to La Roque-Gageac. There is a lovely view of the village as you drift along with the flow and this is the only chance to see the houses reflected in the water. 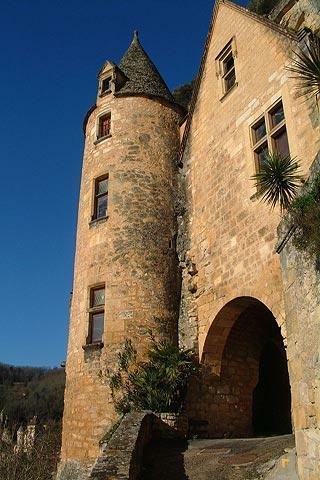 There are many attractions in the immediate vicinity, including many very beautiful villages, lots of great scenery, some of the best known castles in France (a legacy of the Hundred Years War), several important cave systems and many family attractions such as dinosaur parks and recreations of prehistoric villages. The highlight of a visit is perhaps the historic town of Sarlat. 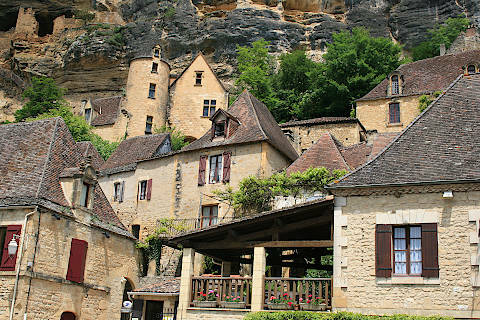 See many more of the most popular sites near La Roque-Gageac in our dedicated Dordogne guide.